Click here to apply for a 2010 grant. 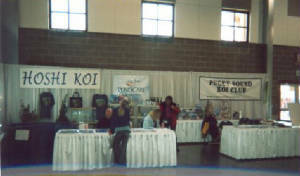 The Puget Sound Koi Club set up and manned a booth at the Spring Fair held at the Western Washington Fair Grounds in Puyallup during the period 16-19 April 2009. Over 118,000 visitors came to the fair and most saw our booth thanks to our location just inside one of the main entrances to the event. John and Cindy Hillstrom organized our club’s participation so that several members were able to pull a shift and share koi info with the public. Hoshi Koi, a local koi dealer and active supporter of the club, supplied a show tank with a variety of koi in different sizes for display and sale. Lots of koi food, books, and related equipment provided much interest for visitors. We also distributed PNKCA show schedules and flyers on preparing koi for showing and feeding schedules for Spring startup in addition to many membership applications for our club. 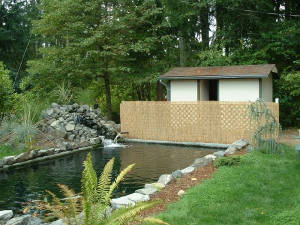 If an interested person lived in another part of the Northwest, we provided the email address of a nearby koi club. The 2009 Spring Fair was the best yet for our club. 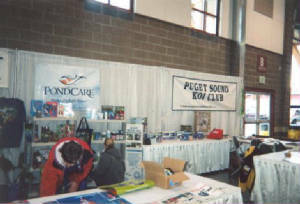 More people stopped by the booth to visit and learn more about the koi hobby. 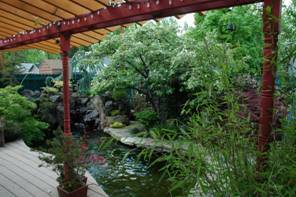 Our location adjacent to the garden show enabled visitors to get ideas on how to landscape koi ponds. We also talked with fair vendors that were interested in developing koi-oriented products in various artistic media. Our club obtained four new members from the fair by promoting the educational benefits of seeing the ponds of different club members when attending monthly meetings. Hundreds of children loved the fish on display and were reluctant to leave. Our club looks forward to continuing our outreach efforts at future Spring Fairs. Olympic Koi, Goldfish & Watergarden club held it's annual Pond Tour on August 1st, 2009. We had 10 ponds on the tour, and even though the turn out wasn't as good as we received last year, everyone who participated reported that they had a good time. After the sessions, our members enjoyed a barbecue, and potluck dinner. Everyone who attended had a wonderful time. Olympic Koi, Goldfish & Watergarden Club. The Siskiyou Koi & Pond Club held our first pond tour on September 12, 2009. We had 120 or more people attend the tour and the feedback we received was all very positive. They liked the organizational features we included but mostly they enjoyed the ponds and the educational features at each stop. 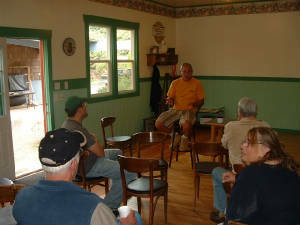 To meet our goal of educating the community about koi ponds and koi, the homeowners talked with guests about their pond experience and shared educational information. 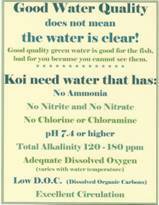 At different homes we covered Safety, The Nitrogen Cycle, Filtration, Feeding Koi, Koi as Pets, Keeping Koi Healthy, The Temperature Connection, Water Quality, What is a Koi Pond, What is a Water Garden, Why Quarantine, How to Quarantine, and Koi Classification. We made large posters for each topic with enough information to start a conversation. We appreciate the effort our owners made to have their yard and ponds looking their best. The owners are Dennis and Dieter Trost, Jack and Barbara Eckhardt, Gary and Sandi Whittle, Lois Rosmarin, Bob and Pat Clasen, Jon and Deborah Clark, Dan and Kristine Merrill and Leanne Russell. 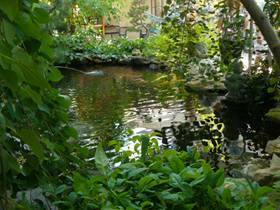 We also appreciate the support and encouragement of our friends in the Oregon Koi & Watergarden Society who attended and took pictures for us. We have a couple new members as a result of the tour and expect a few more to join. 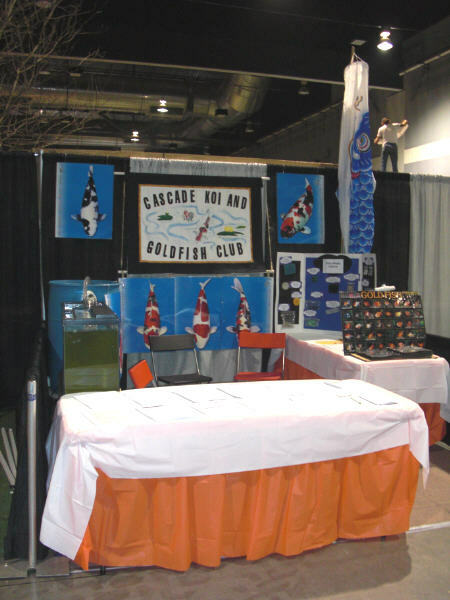 Cascade Koi & Goldfish Club's members participated in the Portland Expo's Spring Home & Garden Show, February 18-22, 2009. Hundreds of people stopped by to check out the 5 month old baby koi on display. Questions of all sorts were answered for inquisitive guests, breaking myths of how difficult having a pond and koi are, to answering questions regarding the set-up and building of ponds, how to handle different problems with ponds and fish. People were informed of all the benefits of being a club member. In fact, we did sign up several new members to our club. It was reported that over 100,000 people attended the 5 day event and out members really had a good time talking with many of them.